Mercator Advisory Group releases a new research report defining the co-brand and private label credit card markets in the U.S.
Large financial institutions now dominate the space and partner with retailers to relieve the demands of consumer credit. There is plenty of room to grow with smaller retailers as e-commerce and mobile payments develop. Private label credit cards, which can only be used in a defined group of retail locations, are a unique and very competitive market segment within the credit card industry. While similar in some ways to co-branded general purpose credit cards, private label credit cards (sometimes abbreviated PLCC) are a complementary product that addresses different needs. They have particular appeal to consumers with low credit scores and a need to finance large purchases. New competition from fintechs like Bread and Klarna is putting pressure on the industry, requiring greater innovation. 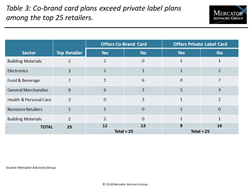 Mercator Advisory Group’s latest research report, Private Label Credit Cards: A Market, Not Just a Niche, sizes the market for private label credit cards and analyzes the growth potential of this often-overlooked market segment. This research report is 21 pages long and has 9 charts and 4 tables. Companies mentioned in this research report include: ACI Worldwide, Albertsons, Alliance Data Systems, Aldi, Amazon, American Express, Apple, Bank of America, Barclays, Bridgestone America, Capital One, Carlyle Group, Chase, Chevron/Texaco, Citi, Comenity Bank, Costco, Credit First National Association (CFNA), CVS, Dollar Tree, Exxon, Federated Stores, First Data, Fiserv, Ford Motor Company, GM, H-E-B Grocery, Home Depot, Kohl’s, Kroger, Macy’s, Mastercard, McDonalds, Mercedes Benz, Nordstrom, Publix, Rite Aid, Royal Ahold, Sears, Synchrony, TD Bank, Target, Toyota, U.S. Bank, Verizon, Visa, Walgreens, and Wal-Mart. For more information and media inquiries, please call Mercator Advisory Group's main line: 1-781-419-1700, or send email to media@mercatoradvisorygroup.com.